If you buy a hybrid SUV rather than a conventional SUV of equal size, you naturally think you have chosen the "green" option. But that hybrid vehicle is not greener than a conventional compact car that gets poorer mileage than the hybrid. In another scenario, a consumer might purchase a new, non-essential, energy-efficient electronic device - possibly because of advertising that suggests the "greenness" of the product - instead of not purchasing any device at all. While the gadget may be greener than a similar but less-energy-efficient competitor, it is not a greener choice than purchasing no device at all. These and other thorny particulars related to "green" products are the subject of an article by Roland Geyer, an associate professor at UC Santa Barbara's Bren School of Environmental Science & Management, and Trevor Zinc, who completed his Ph.D. at the Bren School in 2014. 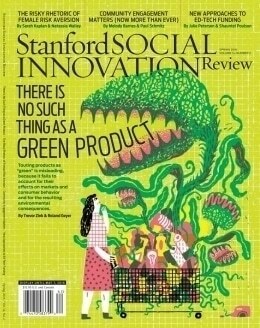 The article, "There Is No Such Thing as a Green Product," is featured on the cover of the spring issue of the scholarly journal Stanford Social Innovation Review. Continuing with their hybrid, example the authors write that the hybrid owner might also drive more than he or she otherwise would, perhaps taking a job that is farther from home or moving farther from work. That extra driving could require enough extra fuel and generate enough additional greenhouse gas emissions to offset the respective savings provided by the hybrid vehicle in the first place. That phenomenon, consuming more when a "green" product is involved, is known as the "direct rebound" effect, and, the authors write, the larger it is, the less green the hybrid vehicle is. In the same vein, the authors note that while the light-emitting diode is in fact the most energy-efficient, longest-lasting, and greenest source of artificial lighting, studies show that as the cost of lighting has decreased, total consumption has increased dramatically. Here, the rebound results from consumers' leaving lights on longer, lighting more areas, buying larger lit products (such as televisions), and finding whole new uses for lighting. In this example, the authors write, rebound can "backfire" should the increase in lighting consumption "outweigh the increase in lighting efficiency and lead to a net increase in electricity consumption." Geyer and Zinc are experts in life-cycle assessment (LCA), which quantifies the environmental impacts of products and services throughout their life cycle, from resource extraction through use and end of life. In the paper, they address the prevalence of purportedly green products, the problem of selecting benchmarks to which they are compared, the limitations of traditional LCA approaches to assessing green products, and the unintended effects such products have on markets. They also offer a new approach, which they refer to as "net green," that addresses the problems surrounding current approaches to producing, identifying and promoting environmentally friendly products. "If there is no such thing as a green product, is the pursuit of corporate environmental sustainability futile?" the researchers ask in the article. "Not at all, but the goal shouldn't be as simplistic as trying to sell as many green products as possible. Efforts to increase the environmental sustainability of corporations should lead to an overall reduction in environmental impact, or be 'net green,' as we like to call it. We define net green thus: A business activity is net green if, and only if, it reduces overall environmental impact."